President Lee, Byung-Suk, Continental Vice President of IBAF and President of Korea Baseball Association (KBA) and Mrs. Kim Eun Young, Vice President of KBA observed Opening Ceremony and a game of Day 1 on August 8 as special guests of JHBF. The singing of the school song by the victorious nine: This honor follows every game. The gathering of dirt: Losing teams typically scoop infield soil into their bags as a memento of having played on Japan’s most hallowed field. Weeping: Is there any nation on earth that enjoys a good cry as much as Japan? 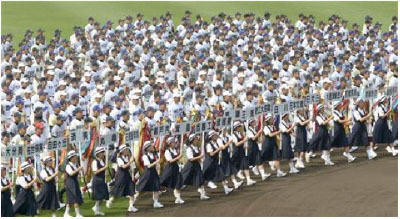 Koshien, with its single-elimination dramatics, offers the perfect opportunity. And television viewers across the land bite back tears in shared sympathy, an entire nation united as one in sniffles.